Say "Aloha" to your MultiPot Pressure Cooker and save yourself a big mess in the kitchen! 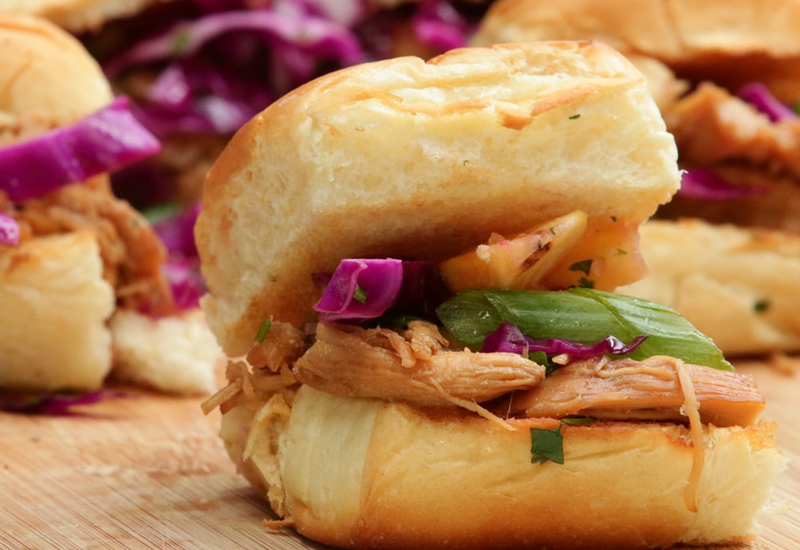 These sweet and savory chicken sliders are a must have item for your next cocktail party soiree. You can also serve them up for an easy weeknight dinner and treat yourself, Hawaiian style. The fresh crunch from the pineapple slaw is the perfect accompaniment to flavorful shredded chicken. These sliders are such a breeze to make, you just might find yourself being transported to Hawaii and imagining a light island breeze in your kitchen! Whisk vinegar and oil together in a large bowl; add pineapple, cabbage, green onions, and cilantro and toss to coat. Cover bowl with plastic wrap and refrigerate at least 1 hour. Mix the brown sugar, chicken broth, soy sauce, honey, pineapple juice, garlic, ginger, and black pepper together in the insert of a pressure cooker. Press Sauté button. Bring the liquid to a simmer on Normal; cook and stir to dissolve the brown sugar and honey completely. Lay chicken into the sauce and turn to coat. Select Pressure Cook (Manual) and cook for 16 minutes on High pressure. Seal pressure cooker and cook on High for 16 minutes. Remove chicken to a cutting board; shred with a pair of forks. Stir cornstarch into the water in a small bowl; stir into the sauce in the cooker. Switch to Sauté and cook sauce until it begins to thicken, 2 to 3 minutes. Stir shredded chicken into the sauce. Toast rolls under the preheated broiler until golden brown, about 3 minutes. Spoon the shredded chicken onto the bottom half of the rolls and top with slaw. Replace the top half of the rolls and cut into individual sliders to serve. Hawaiian-style sweet rolls have a melt-in-your mouth texture. They are soft and fluffy with just the right touch of sweetness. Looking to go low-carb? No problem. Simply double up on the slaw or add a vegetable side to replace the bread rolls. Per Serving: 340 calories; 9g fat; 45.3g carbohydrates; 21g protein; 48mg cholesterol; 813mg sodium. I loved this recipe! I might be biased, because I'm a person who loves pineapple on everything - pies, pizzas, you name it. I don't think I've ever had pineapple on a slider before. The chicken had a vaguely teriyaki-like flavor. On it's own, the flavor wasn't very strong, not like a really sweet bbq sauce. It got much better when you add it to the sweet and crunchy salsa. I had leftover pineapple salsa when I made this, so I used the rest with some grilled tuna that I made the next day. The salsa tasted even better after sitting in my refrigerator for a day. I made this for my niece's Moana-themed birthday party and everyone went crazy! The pineapple was surprisingly very tasty! The chicken breasts came out nice and juicy, and the overall flavor of the dish was sweet and tangy. I will definitely be making this again. Also, instead of buying a whole pineapple, I just diced pineapple chunks that were already pre-cut at the grocery store. Pineapple should be added to every recipe. This tropical dish was perfect for appetizers at my party.. I used mini buns. The Hawaiian chicken was delicious! I didn't do sliders, but instead using regular size buns and was super happy with the results. I love this recipe so much! I did add cheese, provolone and mozzarella to be exact. I also added parmesan cheese to the top of the buns before heating them in the broiler. Not the healthiest, but so delicious when paired with the Hawaiian chicken.